This Tablecraft 5 white plastic funnel set is a necessity for any kitchen or restaurant! Coming with 5 different funnels with diameters ranging from 2" to 6", this set is ideal for making funnel cakes or transferring oils or sauces from one container to another. You can even use it to funnel dry ingredients without spillage or messes. These white plastic funnels funnel substances so well. The different sizes really come in handy with different sized wholes. I highly recommend this product to anyone who needs anything funnled. We like this funnel set, the different size of each funnel is amazing, because you can use for different containers, its easy to clean and the quality is really good. Funnels work as they should. Pretty durable for the price. Withstands hot liquids well. Great product for the price. Each funnel size has its purpose. We use the funnel set to transfer liquids used in infusing our chocolate covered strawberries. But have recently started using them to sprinkle and decorate our sweet treats. Plus it serves as a great mold for both chocolate and jello items we are adding to our menu. Options and price point lead the way. Be sure to get what you need and flexible to your evolving wants. If you are cooking get them. We buy so much in bulk and we place into smaller containers and these come in extremely handy for all those uses! None have broken. Good variety of sizes. Makes transferring things like dressing and aioli into squirt bottles easy. Using the funnels has created less mess and ultimately less product waste. We could not function without these. We regularly pre-portioned ingredients in resealable bags to make recipe preparation easier down the road. We use the Tablecraft White Plastic Funnel Set to make filing the small mouthed bags a breeze. We have run them through the dishwasher numerous times and they are still good as new. Perfect. Good deal for the money. I really only needed the two largest ones, so I just kept the smaller ones for personal use at home. What I really needed was a wide mouthed funnel but couldn't find one, so I just bought these and used a hack saw and sandpaper and cut the funnel spout to the size i needed. Worked perfectly. This plastic funnel set is very useful when transporting our liquids and powders when making our special creations here at Batter and Dough! What a steal! We ordered these after we opened for business, because we never knew we needed them! We use these funnels to get our dressings into our squeeze bottles. The assortment of sizes is great for other food projects. Good, cheap funnels. The heat in my 3 compartment sink has warped the smallest one a slight bit, but it still works just fine. I rarely need to use them, it was just an add-on that every kitchen should have. If I relied on funnels daily, I would certainly spring for better quality. For my current, limited use these are fantastic for the money. We use these funnels for a variety of things, from baking, cooking, and even mixology. They stack nicely which makes them easy to store and find. Great funnel set! It is durable and so easy to clean. It is at a very good price! I'm able to pick which size I want! I would recommend to others! These have worked great for us. It is sturdy and easy to use. It holds up well and we have had no problems with it. at all. Exactly what I needed and was looking for. Tablecraft is a well known quality hospitality brand and these hold up to their reputation. Lots of different sizes! I make homemade infused olive oils and salad dressings and these funnels are perfect for storing in the rubberstop bottles. I like the varying sizes for both the thickness of my dressing and for the varying size of bottle mouths. Any kitchen needs this very often overlooked essential tool of the trade. This little assortment of funnels comes in so handy so many times every day. Sometimes it's difficult to transfer liquids into other containers, but with the various sizes that come with this set, it's very easy. They are made of durable plastic and are easy to clean. Wow! Talk about a variety of funnels. These Tablecraft funnels meet our restaurant needs perfectly. Very affordable and good quality. We are very happy with these. What an amazing and inexpensive funnel set. We would recommend these in any kitchen, small or large! Our staff enjoy using these because they smile and giggle every time they see the infant size funnel. Perfect in every way! And I HAVE shopped around--you simply will NOT beat this price. Period! The multiple sizes are so darned convenient, and you can't beat the price! Super affordable and perfect for filling small bottles with dressings or spices, draining things, etc. These are also easy to clean and don't seem to stain. Great little set that works for all kinds of jobs in the kitchen. No need to purchase anymore funnels after I purchased this set and put it to use. Great little funnel set to have handy. The only problem is not losing the smaller ones! Seems like i need a bin strictly dedicated to these..
We are happy with these funnels They are exactly as described, and fit perfectly on our shelves. They are clean looking and we have never had a problem with them. Great funnels. We use them to fill squeeze bottles and having assorted sizes is handy. The plastic is thick and they wash well in the dishwasher. You can never have too many funnels. We liked that the set came with multiple sizes. They work great for liquids as well as spices. Good cheap funnel set. Good for small projects. We use them to fill bottles and shakers. The plastic is cheaper than I would like but adequate for small jobs. Thick, heavy duty plastic. These are completely solid white and stack inside of each other very well. The small is very small, and fits perfectly into extra small squeeze bottles on the garnish station. Great set of basic funnels, Have held up great for general use and don't stain even with tomato based sauces. The nesting design makes then easy to store and keep together. This plastic funnel set is so handy for many things. I use the small ones for filling my small pastry squeeze bottles with chocolate. They all store inside each other. This is a great funnel set. Honestly i thought they were going to be cheesy because of how cheap they were, but very durable and nice. I like the set because it comes with multiple sizes which is perfect because some items are small and others are large. The little one works perfect for filling the salt and pepper shaker. These are great and keep my jars clean. I use them every chance I get and the different sizes really come in handy. I use them for spices up to portioning. We use these at my business for funneling homemade sauces, syrups and dressings into squeeze bottles for service. They work great I just wish they had something to tie them together. We use these funnels all the time in our restaurant from transferring catsup to smaller bottles, to filling salt shakers. Very economical set that we couldn't live without. Highly recommended. These funnels are perfect for kitchen use but we also use them around the house and garage. These make transferring liquids or powders from one container a lot easier. The tablecraft 5 white funnel set is a good basic funnel set. I don't use funnels very often but every once in a while you are glad to have them around. Our kitchen crew use these alot. The size variance is helpful for dressings, sauces, and other liquids. They also use them for salt & sugar refills. Awesome funnels! They are great for pouring bulk spices into smaller containers. Way less spillage so less wasted spices. The price is great too. The durability is good. I love these because they are stackable and are also easy to clean (I use the pastry tube brush that I ordered from Webstaurant ITEM #: 1441661). I make homemade kefir milk every day and even though I use a strainer, it creates quite a mess. I got sick of stuff getting all over the mouth of my jars and running down the sides that I needed funnels for this to be less of a headache. Having the multiple sized funnels for my different size mason jars is just beyond a perfect solution. Thank you Webstaurant! Economical set for a staple in the kitchen. We use these for a variety of things. The large size is great for refilling the ketchup bottles. You never realize how much you need a funnel if you've never owned one. Great for liquids, spices and small grains. Holds up great in top rack of dishwasher. Multiple options on sizes that fit into each other for simple use and storage. Easy to keep clean and do not stain. Would recommend purchasing. The fact that it comes in set of five is awesome! Different sizes for my different needs. Made of good quality of plastic! Really good find! great funnels, i would use them for liquids most of the time, but other than that, i use them for certain dry goods, but nice quality plastic! These are very convenient to have around. They easy and lightweight and whenever you find yourself on that rare occasion needing a funnel, you will always have one at the correct size. These are just what I was looking for. They have a more brushed texture on the outside but a smooth inside letting ingredients slide easily. Many sizes should be one for most jobs. Great sizes included in this set. Light weight plastic funnels, great for every use, easy to clean and easy to store as they stack in one another. We just love this funnel set. The price is great too. And you get a set of 5 funnels. Good for funneling pretty much anything. This is a great set of funnels that come in a variety of sizes. Makes transferring liquids into containers so much easier. Keeps your work space from getting messy. Sir Clean recommend this product funnel set for the quality and price, the material is very resistant and you can use to tranfers any liquid. Good that they came in 5 sizes, and did what it was supposed to do, but the smaller sizes are hard to clean and store. I love how these are well-made. I like how there are various sizes for a very small to large. I will definitely buy them again if I ever need them. And I will also recommend them to friends and family. I will definitely continue to use your site in the future. A great set of funnels. A size for whatever you need it for. Seem sturdy and well made. Haven't noticed any staining or lingering odors after using them. Overall a good value. These funnels are pretty flimsy and tend to warp in the high-temp dish washer. That said, they do the job they need to do, and the cost is hard to beat. Great product! It comes with five different sizes, which is extremely helpful while putting fresh ketchup in a speed pourer, or olive oil in squeeze a bottle. Great funnel set and the price can't be beat. We use these a lot and so far we have not had any issues with them. Perfect for everything, a great price, and even better a perfect size no matter the job. From filling salt shakers to squeeze bottles and anything else these plastic funnels wash and dry easily and store inside themselves for space saving. What's not to like? 5 funnels for this price is a good deal. We haven't even used most of them but i figure they are handy to have around a kitchen. This set of funnels does the job. They are not thick and heavy, but for the price, you just can't beat them, and the job gets done. Cheap funnel set that still is quality constructed. You get all five funnels for the price of what you might pay for one somewhere else. I myself am not much of a reviewer, but I feel the need to praise these funnel set. The different sizes are extremely helpful. The smallest is perfect to funnel sugar into our simple syrup bottle which abnormally tiny. Will recommend this product. This funnel set is diverse and because of the 5 different sizes, is great to have on hand in any kitchen. This product is highly recommended by our staff! Absolutely a great value. Enough variations in size in the set to address most needs -- from wine back into the bottle to occasionally being appropriated by a child to refill his toys. No challenges with taste or odors, and we have placed it in the dishwasher without discernible shape change or anything else. Very recommended. 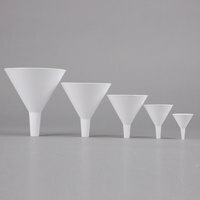 TableCraft 5-Piece white plastic funnel set is basic and very simple. The funnels make pouring and filling other containers very easy without making a big mess. They've come in very handy and our kitchen staff is happy with the purchase. A great set. Hard to find a set of funnels for less, even at a hardware store. I can use these now for food or even garage projects. A good set of funnels that can be used for filling bottles with wet ingredients, or for use with dry ingredients like rice, cornmeal or flour. There are five sizes ranging from 2" to 6" which should handle most of your needs. This is a great basic white funnel set. They are quite durable and have not stained. They are a great value and I highly recommend! This is a really nice assortment of funnels. We use them every day and they work wonderfully. They are heavy duty plastic and function well. The Tablecraft 5 White Plastic Funnel Set is a great by. We use them to fill squeeze bottles. They are a great value for the price. I was not expecting much from the 5 piece Tablecraft plastic funnel set because of the price for the set. When they came in i was pleasantly surprised the plastic was much thicker then expected. A good buy from websturant. Nice inexpensive funnel set with a variety of sizes for every need. Easy to clean and wash. Have used them quite a bit. Highly recommended. Must have items for filing salt and pepper shakers. I also use them for filing parm cheese, red pepper and other spices used while cooking. Good funnel set. It gets the job done. I use it for oils and sauces. Just a nice solid set of funnels to keep in the kitchen. The item is what it said it is. It is a funnel set for a decent price. I have seen many other funnel sets of same quality for same price but it does pretty well give you any particle size funnel you may need which is now. This funnel set comes in so handy - I use some to bottle sauces/oil and I use the large one at home change the oil on my generator. What can you say, they are funnels. They do the job they were meant to do. The various sizes are handy so there is no need to constantly try to use a funnel that's the wrong size. These have come in very handy when having to transfer many different types and sizes of chemicals into smaller dispensers! Each size funnel works perfectly for each size cleaning bottle! During a recent church event we found multiple uses for these handy funnels. They were great for sauces, ketchup, and other liquids. We are very pleased with this purchase. This funnel set is a great deal for the price. You get 5 different sizes for all applications. Very durable and easy to clean. Hold up great through dishwasher. Highly recommend. Sturdy funnels, easy to use and clean. Well balanced, which helps avoid spillage during pouring. Multiple sizes makes any project easy to complete and achieve quickly. This funnel kit has every size you would ever think of in a funnel. I love that for a very low price, I have a whole set that can take care of all my funneling needs. Since I am a baker, I need all sorts of sizes to funnel into small or larger containers. I especially like the extra small funnel that can fit into small jars and squeeze bottles and is pretty hard to find. A great set! I use these funnels to help fill dry products and they work really well. I love all of the different sizes that this pack has to offer. Big or small, this funnel set has exactly what you need for any job. We seem to use at least one every day, and they work great with both powders and liquids alike. Such a wonder to find 5 different funnel sizes and at such a great price (I bought 2 sets - because you never know...). I especially like the smallest which I used yesterday to transfer some essential oil to another bottle because the original bottle just would not pour or drip unless I removed the spout. - And I know I'll be using all of these because of the various size bottles that I have started using for food or homemade lotions/toothpaste/mouth rinse, etc. Where would I be if I had not bought these funnels???? Very upset, I use these funnels almost every day in some capacity, wet or dry they are great to have on hand. When searching for a new funnel, I came across this pleasure pack of five different sizes. Why buy one, when for a mere cost you can have five. More funnel's than one man needs. The perfect set of funnels for any kitchen needs. It comes with a couple of funnels that are ridiculously small, but you'll find a use for them as well (filling salt shakers). This is a simple assortment of inexpensive funnels. They are durable enough for solids and liquid items. The assortment is great for small containers and large containers. A very handy set of funnels in various sizes. We use them to help pour liquids from larger containers. For example, we pour directly from a large metal container of olive oil into a small bottle used at tables. Both products proudly purchased from Webstaurant! What a nice set of funnels. I prefer them over my aluminum ones most of the time and almost always find a good match for whatever job I'm working on. The super smooth plastic allows a quick flow of liquids and solids. As a painter, I use these funnels for refilling various squeeze bottles with liquid painting additives for acrylics (such as glazing medium, GAC 800, and fluid acrylic paint.) The best part is that acrylic paint peels right off this kind of plastic when dried. It is nice to have a variety of funnels around just in case you need them. I might not ever use all of them, but they are cheap enough the have around anyway. Finally, a good, cheap set of funnels. I can use these for just about anything. I like that if I break one, the set is still cheap to replace. For the price, this is a nice set of funnels. Great selection of size. I haven't used them yet, just got them washed and ready. They appear to be very functional. Extremely helpful to have 5 different funnel sizes. This set supplies one for every thing you need it makes life in the kitchen a bit more efficient. These Tablecraft funnels are good to making my job easier in the kitchen. I Puchased these and several others when I opened for business. Good funnels. These five different sized funnels are great for pouring liquids into containers with small circumferences so the liquid does not spill every where and make a mess. This five piece set of plastic funnels are great for any establishment. I use the large funnel a lot because I transfer canola oil into smaller containers. These plastic funnels are great to have in the kitchen. No more spilling canola oil when pouring it into a bottle. It makes things a lot easier around here. The Tablecraft 5 Plastic Funnel Set. It is great the funnel's range from 2" to 6" in diamater. You nbever know what size you're going to need. These funnels are great for filling squeeze bottles with different flavored oils, cold sauces and salad dressings! Nice for plating! Good funnels for draining oil from small tabletop fryers!!! These are deffinetly nice to have in your restaurant. they make for no spill and no waste filling of salad dressing containers and olive oil containers. These are fairly cheap funnels that work for everything you would expect them to. If you are careful with them, they should last. They nest nicely. The Tablecraft 5 Plastic Funnel Set. Is nice to have around.We used to always look for a funnel and now we can find one .The price is right and they are east to clean.Don't let the price fool you. they are great. this pack of funnels takes care of all sizes you may need for small or medium establishments. I definitely recommend this pack. They're a good price too. A very cute and very functional set of plastic funnels. They fit almost anything, as long as you don't need something that is too big. Great set of funnels. A size for every job. Well made and sturdy. Great product for the money! you can't go wrong investing in these. I expect to have these for a lifetime. The Table craft 5 plastic funnel set is great for filling the small bottles. The funnels work great, stain resistant and are very easy to clean. These funnels were inexpensive enough that if we lost them we would not be out of a lot of money. Do not equate inexpensive with built cheaply. They are great quality for filling items with smaller necks such as salt, pepper etc. They are not for use in very thick viscous materials. I USE THESE FUNNELS FOR ALL SORTS OF DIFFERENT APLICATIONS, FROM AUTOMOTIVE TO COOKING. OF COURSE SEEING THAT THERE ARE 5 DIFFERENT SIZES OF THE FUNNELS, I DO NOT USE THE SAME FUNNEL FOR COOKING THAT I USE FOR PUTTING OIL INTO MY CAR.